I've posted a reply to this in The Ritz Cinema/Bingo Hall, Chatham High St. thread. The Ritz and Regent were both built in either 1937 / 8. I cant remember which was built first. I watch them both being built. Probably on a Saturday. The Ritz had a huge sprung carpet on entry. The Imperial Picture Palace, probably taken sometime during the 1920's. designed by the ubiquitous G. E. Bond in the "free renaissance" style and built for a total cost of £11,000. It was later renamed "The Regent" before being replaced by the "Super Regent", the subject of this thread, in 1938. 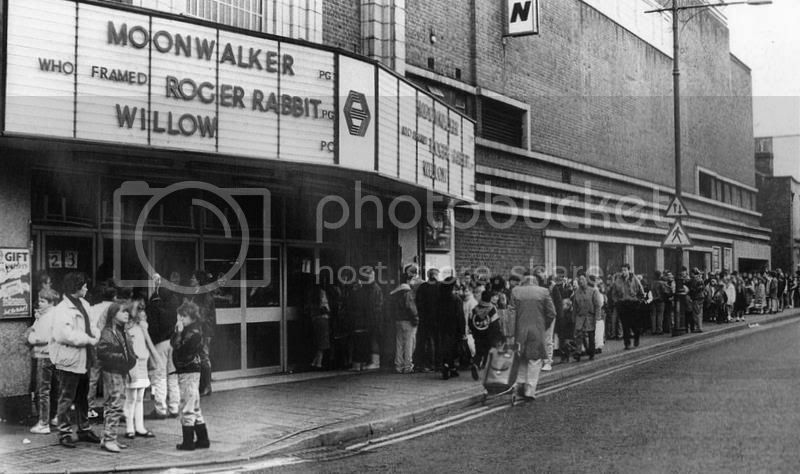 I can remember going to that cinema with my family when I was a child a couple of times (about 6 times I think). The one I remember the most was Who Framed Roger Rabbit when I was about 8 or 9 years old, which interestingly enough can be seen advertised in this photo above. I can remember my mother taking me there straight from school, and because time was a bit short I didn't have time to go home and change, so I spent the entire film sitting in the audience still wearing my school uniform! Other notable films include Hook (that one about Peter Pan starring Robin Williams and Dustin Hoffman, and that was about 1990) and the hugely popular Jurassic Park, which was released in 1993. I can remember my mother taking me to see that during the summer holidays. Peter, I agree with you. "Flea pit" ( or Bug Hutch) were generic terms for older run down cinemas, the Invicta and Picture House would certainly fit in to this class. However, the ABC was a 1930's super cinema which was built for comfort. It had very strong competition from other super cinemas nearby, the Ritz, Majestic, Palace, Embassy, and to a lesser extent the Plaza. Cinema managers in this era went out of their way to attract customers and make them feel special. I think all cinemas were called the 'flea pit' - the 'Picture House', under the Empire Theatre, was, and I've just asked my wife if she knows where the 'flea pit' was and she replied "The Invicta", in Chatham High Street. I think it derives from the transfer of livestock between humans in close proximity! Does anyone recall the small bar inside serving spirits? I recall it was based in the lower level past the lounge/bay area that people used to wait in during intermissions of longer movies. I never even knew of the bar until the late 80's, but I think not a lot of people knew of existence then either. It was a small room that could have been a time capsule from the 70's, even the woman behind the bar looked like an extra from Bultins or Hi-De-Hi and had a tiny little pastel coloured radio playing ballad music. And does anyone know why the theatre got the dubious nick name of 'the flea pit' ? Is there a date for the photo? Before it was called the Regent it was the IPP (Imperial Picture Palace). Closed in 1937, rebuilt and reopened in July, 1938 as the Super Regent. The 'new' Regent extended right to the edge of Cage Lane, with its entrance immediately on the corner in the High Street, so that the seating faced eastwards, towards Luton Arches, and not at right angles to the High Street like the Ritz was. Queues for seats extended up Cage Lane, and the cinema staff would come round the corner and announce "three one and sixes available", or whatever the case. I think the date for the rebuild was just pre-war, possibly 1937-1939. Is there a date for the photo? It is the same location but it is the first of the two buildings to be there. Sorry I don't have dates for the rebuild. This is entitled Cage lane area. Regent cinema can be seen on the right. Is this the same cinema? Both the Ritz and Regent ( as the ABC Cinema was known) were ABC cinemas. Please find a story about my cousin Keith Wilson who took his mum to the ABC Chatham, to see International Velvet. This was his first film that he made the background scenery for. Keith is from Chatham. More about Keith Wilson life is contained in personalities section of the forum. He made 41 films and TV series many I am sure you have seen and not realized he was a local lad. The Regent site has now been rebuilt it has a hairdressers and an English Churches homeless shelter there now. There are also private flats up above it. The two 70mm projectors from the Ritz went to ABC theatre 2.